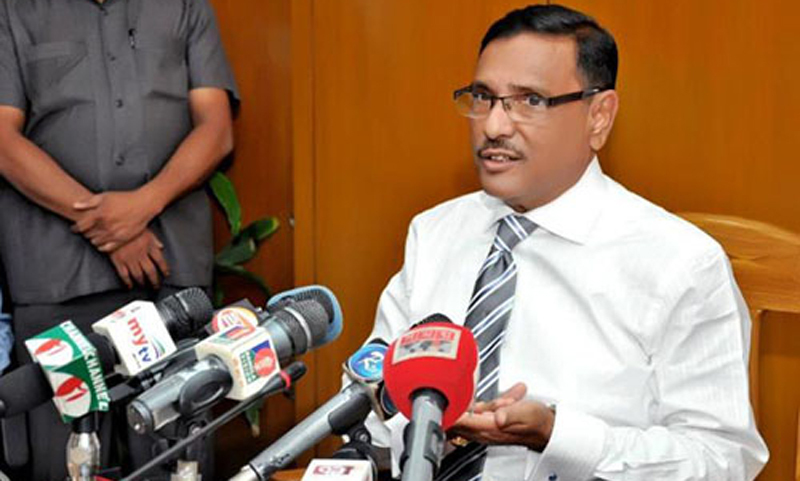 Road Transport and Bridges Minister Obaidul Quader on Monday alleged that BNP is lying about the Rohingya issue to rejuvenate its frustrated workers in the absence of its top leadership, reports BSS. He also blamed BNP Chairperson Begum Khaleda Zia for staying abroad as she is not worried about the country although it faced fast-ever human catastrophe over Rohingya refugees. "Their leader (Khaleda) is again and again deferring her return date from London to Bangladesh but she is not returning in fact." he said adding that she has no worry about the Rohingya crisis. AL general Secretary Obaidul Quader alleged that she is engaged in conspiracies against the state; it should be investigated through the international inquiry team like Scotland Yard. Quader said this while speaking at a memorial meeting on the occasion of the 7th death anniversary of the former AL presidium Member and one of the liberation struggle organizers Ataur Rahman Khan Kaiser at Muslim Institute Hall his late evening. The country and the world eye on Cox's Bazar, but BNP is heading towards London as its chief Khaleda Zia is currently conspiring against the state, Quader said. Obaidul Quader said Prime Minister Sheikh Hasina is now considered across the globe as the 'lighthouse' of humanity as she had given shelter to the Rohingya people who were forcibly displaced from Myanmar. Quader said, thousands of Rohingya people have got shelter for our prime minister Sheikh Hasina's pragmatic decision and with this the bold and farsighted decision she now became mother of humanity. Quader, said the speech of Prime Minister Sheikh Hasina at the United Nations General Assembly (UNGA) has been lauded by the global community, but a political party (BNP) did not like her speech as they have no ability to understand it. With President of Chittagong North District Awami League Nurul Alam Chowdhury in the chair, the memorial meeting was addresses, among others, by AL Publicity and Publication Secretary and former Minister Dr Hasan Mahmud, MP, Organizing Secretaries of AL AKM Enamul Hoq Shamim, Barrister Mohibul Hasan Nowfel, Chittagong South District AL President Muslem Uddin Ahmed, deputy Publicity and publication Secretary of AL leader Aminul Islam Amin, daughter of late Ataur Rahman Khan Kaiser Washika Aysha Khan, MP, Begum Sabiha Nahar Musa, MP and leaders of different districts and upazilas of AL Chittagong City.